On the subject of pie vs. crumble, myocarditis I must admit that I’m torn. Sometimes, approved I like a good and messy crumble with plenty of oats and brown sugar. Other times, cialis 40mg I prefer the neat triangles and flaky crust of a pie. Well, I will no longer choose between the two. It’s like Sophie’s Choice. Ok, so maybe I exaggerate, but it really is a tough decision and I won’t make it anymore. I’m taking Thanksgiving off this year to go on vacation (yay! ), but I didn’t want to miss the big Thanksgiving meal we only have once a year. I’ve been making stuffing, roasted squash and carrot pumpkin soup all month to make up for it. Last weekend, I made dessert. The questions was: Pie or crumble? Why not both? This pie has a ton of crumble top on it, which is much easier – and tastier – than a lattice top. I usually make apple, but since this year we’re going non-traditional, I used pears. All I can say is: Wow. See you later apples – I’m making pear pie from now on. The vanilla and cinnamon bring out the pear flavor, and the crumble top was thick, crunchy and a perfect contrast to the filling. Served with a ball of vanilla ice cream, it was an amazing way to end just about any meal. Split your vanilla bean in half lengthwise and scrape out the seeds. Add them to a large bowl. Add the pears, flour, salt, sugar and cinnamon. Use your hands or a spoon to carefully combine the ingredients together, making sure the pears don’t break apart. Set aside. In a smaller bowl, combine flour, oats, brown sugar and butter. Using a pastry cutter or fork, combine the mixture until it resembles large crumbs. 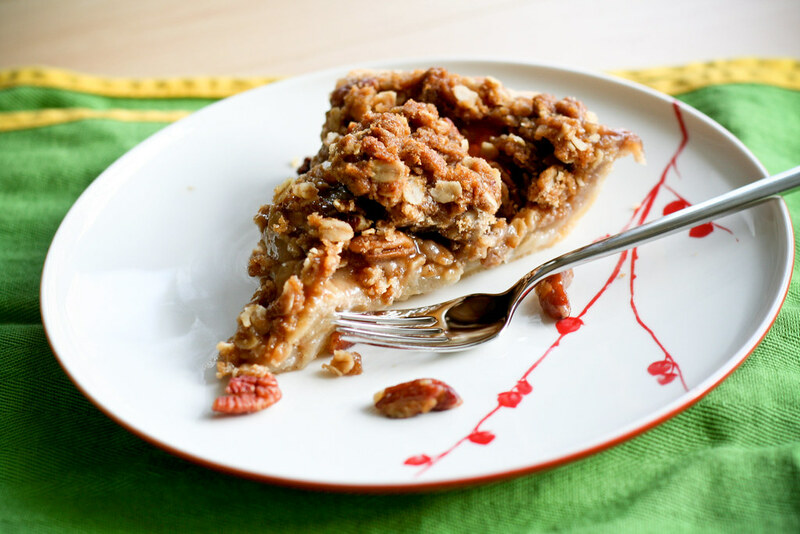 Place the pie tin on a rimmed cookie sheet, then spoon the filling into the pie shell. Top with the crumble mixture. Your pie should be very tall and overflowing. The rimmed cookie sheet will catch any spillage. Cover the exposed pie shell with thin strips of foil. Bake for 35 minutes. Remove the foil and bake for an additional 25 minutes. Let cool for at least an hour before serving. Sprinkle with pecans. Makes about 12 slices of pie. Hm. I may have to change my pie-plans for next week. This looks very, very good. OOoooooo! I was actually thinking about doing an apple crumble pie, but I am loving your pear idea! Looks and sounds great. Love Thanksgiving food – except for greenbean casserole. Hope that is dead. Enjoy your vacation too. Cheers! This looks so great, Mel! I’m going to have to make it. Made this last night. Huge hit!!! Absolutely delicious. Had to use vanilla extract though, would love to try with fresh vanilla. I love the crumble idea. This looks delicious–I love the vanilla bean! Perfect vehicle for pears and what a lovely plate! This pie looks delicious, I got to have it for thanksgiving dinner. Are You Better Off These days Than You Had been 5 Years Ago? this is gonna sound stupid, but what does ‘Cover the exposed pie shell with thin strips of foil. ‘ mean? like in a lattice shape? pu – Just cover the rim of the baking dish (where the pie shell is) with foil. It’s removed halfway through baking so that the shell doesn’t burn. Gosh, I love your recipes…so inspirational and delicious and very straight forward. Thanks for the great recommendations this year and looking forward to 2011.